Eileen Myles , The Importance of Being Iceland: Travel Essays in Art (Semiotext(e) / Active Agents). Eileen Myles reads from Sorry, Tree. ; Matthew Sharpe reads from Jamestown. ; Mikita Brottman reads from The Solitary Vice: Against Reading (Counterpoint). Eileen Myles's book Chelsea Girls: A Novel was available from LibraryThing Early Reviewers. 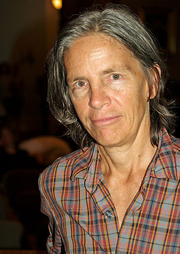 Eileen Myles is currently considered a "single author." If one or more works are by a distinct, homonymous authors, go ahead and split the author. Eileen Myles is composed of 2 names. You can examine and separate out names.